The popular Harlem Globe Trotter “Stretch” teams up with Safe Laces to keep active kids and athletes safe by helping keep their laces tied. You are here: Home / Featured Products of the Week / The popular Harlem Globe Trotter “Stretch” teams up with Safe Laces to keep active kids and athletes safe by helping keep their laces tied. Anyone who wears any type of shoe with laces knows the struggle of keeping them tied. Some days it’s just an inconvenience and other days it can become a major safety issue. Thousands of people sustain injuries from untied shoes whether its kids on the playground, runners in a race or just everyday tasks. Any basketball player especially a Harlem globetrotter knows all about the importance of tying your laces properly so that you don’t trip on the court. 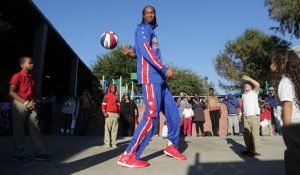 Because of this, Harlem Globetrotter Jay “Stretch” Middleton decided to team up with Safe Laces Active to help make shoe laces safer. Safe Lace has been vigorously tested in all types of sports – football, basketball, tennis, soccer, golf, marathon running, gym workouts and even obstacle races. The Safe Laces were proven effective in keeping the laces tied better. We had the opportunity to try these out and they work great! I highly recommend! Self Disclosure: I received free samples to facilitate this post. Information and images were also provided.